Bring the essence of springtime from the outdoors to the indoors with these baby favor ideas for your baby shower. The spring season means lots of time spent outdoors, and if you’re having a spring baby shower, baby favor ideas with springtime touches can bring the beauty of the outdoors right inside to your baby shower venue. Whether you’re planning an all-out garden party theme for your shower or you’re looking for subtle ways to enhance your shower with the spirit of the spring season, baby favor ideas with springtime touches will do just the trick. The only challenge is choosing from the wealth of spring baby favor ideas available! 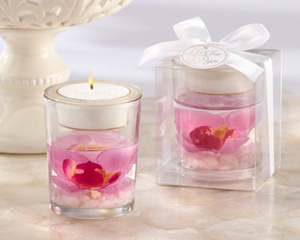 “Elegant Orchid” Tea Light Holder—Are you having a girl or hosting a shower for someone who is? These gorgeous tea light holders have the perfect touch of pink color to celebrate a baby girl theme. Their name says it all—they’re super elegant and ideal for bringing a touch of sophistication to any shower occasion. Eiffel Tower Personalized Stemless Wine Glasses and “Fleur-de-Lis” Ceramic Salt and Pepper Shakers—Springtime in Paris is famous amongst tourists, natives, and francophone enthusiasts alike. 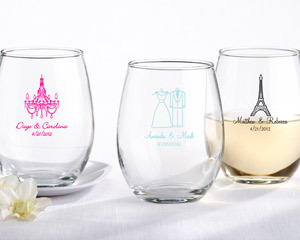 If you’re using a vintage, floral, or Parisian baby shower decor theme, consider giving your guests these personalized wine glasses with the Eiffel Tower graphic option. 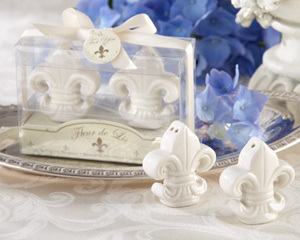 You can also give everyone the “Fleur-de-Lis” Ceramic Salt and Pepper Shakers. These pretty, elegant shakers add some instant Parisian springtime flair to your place settings and they make nice keepsakes as well. 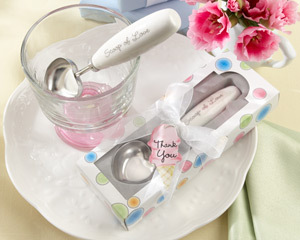 “Scoop of Love” Heart-Shaped Ice Cream Scoop in Parlor Gift Box—What’s warm weather in springtime without a little ice cream? These ice cream scoopers are versatile, practical, and come packaged in colorful little gift boxes with pastel polka dot designs. They can be used to celebrate the arrival of a little boy or little girl and are sure to serve up some yummy treats. 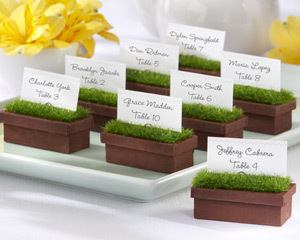 “Evergreen” Window Planter Place Card Holders (Set of 4)—Bring the garden indoors with these vibrant place card holders. Use these baby favors with your place settings to create a cozy, springtime feel for your guests, and let them add some subtle springtime touches to your tables. This entry was posted in Affordable Baby Favors, Place Card Holders, Popular Baby Favors, Spring Baby Favors, Unique Baby Favors and tagged baby favor ideas, baby favors, baby shower favor ideas, baby shower favors, candle baby favors, Favors, personalized baby favors, spring baby favors, spring baby shower favors, summer baby favors, unique baby favors. Bookmark the permalink.